This is a first look in the box for the newly announced GMC/Bofors. So, first the history lesson. The US Military asked various companies to design a troop transport vehicle, and the GMC was the chosen producer. 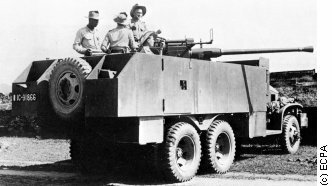 Serving almost every softskin need, the GMC CCKW353 was sold all over the world after WW2 and served in many armies. The Bofors 40mm equipped vehicle serving in France. The box is the usual top opening carton made of quite thick card, mine came from Hong Kong with no damage at all. The decals are well printed, and the colors appear to be solid; although how the white will go over OD paint remains to be seen. Instructions are well printed and look to be clearly laid out in obvious steps. I can see that assembling sub-assemblies for ease of painting is easily possible. I bought mine from Hobby Easy for about £18, but as it is not yet listed in any of the usual UK shops I don't know what the local prices will be; hence I haven't listed a price in the info box of this submission. Highs: Appears to be cleanly molded with plenty of detail. Interesting and unusual subject. Verdict: Looking forward to building this! Copyright ©2019 text by Dave Cox [ DAVECOX ]. All rights reserved. Its also very welcome to those who dont build from any specific side and like interesting vehicles, A friend built this years ago, using an available conversion set, and I always liked the look of it. Now I have the chance to build it OOB. Thanks for the review Dave. Glad to see its got plastic tyres and not vinyl. This is a peeve of mines and if vinyl were included, Id have to get resin, which adds to the cost as well. Looking forward to some online builds now! !